Busot is a small but charming village set 5km inland from the coastal town of El Campello with its fine, sandy beaches. Busot is only 10km away from the major city of Alicante which is the gateway to the Costa Blanca region with the international airport of Alicante providing numerous flights from all over Europe. Once at the airport you have a range of different airport transfer options to Busot including private shuttle buses, taxis or Busot car hire. The population of Busot is just 2,600, many of which live on the urbanisation Placita de la Lloma, urbanisation Llano de los Pastores, Teular, Hoya de los Platos and Bonalba Alta. A holiday or vacation in Busot allows you to be in a very good location on the Costa Blanca – you are close to beaches, Alicante and Benidorm, yet you are away from all the hustle and bustle. Enjoy a flavour of traditional, real Spain. Busot has a small selection of shops, restaurants and bars where you will find and enjoy traditional Spanish food of the region. 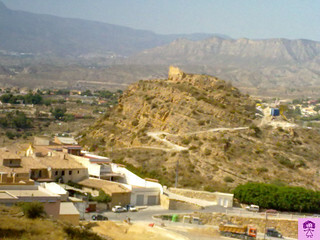 The tourist highlight of Busot itself is the 12th century Moorish castle which was part of Alicante’s medieval defences. Also be sure to visit the famous Cuevas del Canalobre, these are caves, millions of years ago which have a fantastic main chamber in which acoustics are so good concerts are held in them. Located in Busot, at the entrance to the lovely Pueblo which has bars, restaurants, shops, school and more, the semi detached villa is built over 3 floors. Just 2 years old, the property has a good sized fitted kitchen with breakfast area, there is a large lounge with open fireplace and dining area and doors to a large terrac. There is a master bedroom with lots of wardrobes and an en-suite bath room. On the upper floor are 2 further bedrooms, both with wardrobes and doors to a terrace which has views of the mountains and to the sea at Alicante. There is also a shower room on this floor. The basement is very large with parking for 2 cars and there is a further covered terrace with BBQ. The garden is easy to maintain and has a private pool. There is also a driveway accessed through electric gates which provides further parking. There is wiring for satellite TV and no problem with a telephone line and internet access. Rental per month is 850 euros plus bills. Contact the owner, Lisa Turner, directly for more information on 645 118 208. Below is a video featuring some of Busot’s most breathtaking places. Are you an expat in Busot? What do you like/dislike about it? Let us know in the comments box at the bottom of the page. Busot Page Summary – This page contains unique content about the small but scenic town of Busot, close to Alicante on the southern Costa Blanca coast of Spain. Busot is one of the costa blancas hidden gems, a genuine spanish old town, nestled in mountains it has a very personal and welcoming feel, we adore the place, we have travelled across spain and been to a lot of different areas but busot was somewhere we never forgot, when it came to finding somewhere to settle it was our number 1 choice. Very close to el campello another unspoilt area that we liked due to its lack of too many tourists, only those “in the know” enjoy el campello. hello robin here ….. i have been in the áreas with tourists many times … when you go to play golf … ensure you stay a bit longer …go to the top of the hills next to the kaves …. look around …. the quiet área is superb .. you will see lots of delightful mature spanish lokals …….. ensure you take a day to enjoy the área ….ENSURE … you go into the kaves ….interior is amazing and tottttttttallllllly relaxes your mentality .. a beautiful interior and musik. i am able to tell you more local info as i have been there with people on holiday.